Why Is A Grocery Store Censoring Elton's Us Weekly Cover? Why Is A Grocery Store Censoring Elton’s Us Weekly Cover? Mountain Home, Arkansas’s Harps grocery store is ruffling feather boas with their censoring of Sir Elton John and David Furnish’s Us Weekly cover with new son Zachary. A placard over the two men and their child reads “Family Shield. To protect young Harps shoppers.” How about protecting young shoppers from poor execution of the English language? Is that not a concern? 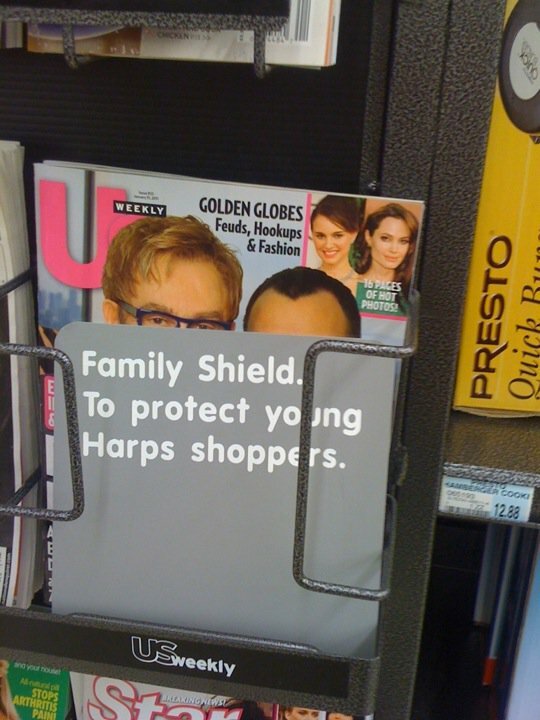 Issues of grammar aside, this “Family Shield” is the very type of thing used in gas stations to censor the covers of pornographic magazines. Elton and David’s cover hardly even shows the two well-dressed men even touching. So what exactly are these young people meant to be protected from? The knowledge that homosexuality exists? Completely legal and internationally recognized parental rights? Just what is so harmful here? Bigots, man. They are making our arguments against them for us. Are you angry to see this gay family censored?